One study abroad program celebrated its 20th anniversary this summer; another deployed its first students. Both were transformative for the Tar Heels who took part. Asian studies faculty members Afroz Taj and John Caldwell reached a major milestone this summer — celebrating two decades of taking UNC-Chapel Hill students on a study abroad experience to India. The UNC Summer in India program is one of the longest-running faculty-led programs offered to U.S. college students. Taj and Caldwell have led about 300 students through the program over 20 consecutive years. Taj first left his home country of India 37 years ago, but he says the experience of returning there with students never gets boring. Each year is fun and different. The two colleagues first met in the mid-1980s while doing graduate work at the University of Michigan. Years later, they both came to UNC. In 1999, they took their first 14 students to India. They were looking for a way to create a meaningful immersion opportunity for students to practice the Hindi language. The course structure has evolved over the years. 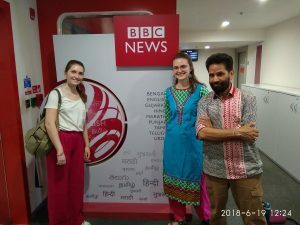 Fourteen students took three courses during this summer’s six-week experience — “Contested Souls: Introduction to Indian Literature and Culture,” “Journalism and Society in India” (a highlight is a visit to the BBC bureau in Delhi) and “Hindi Conversation and Script.” The language course is designed to be accessible for beginners as well as challenging for more advanced learners. Junior English major Madison Haynes participated in the program through a Phillips Ambassador scholarship. It was her first time leaving the country; she didn’t even have a passport until a few months before the trip. 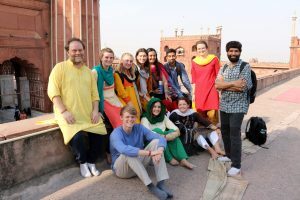 Students spend about three weeks in New Delhi, the vibrant political and cultural capital of India, with multiple excursions, including an extended stay in Jaipur (the “Pink City.”) They also participate in two-night homestays with Indian families. Even though Rohan Patel is of Indian descent and had visited Gujarat, India, when he was 6, he said this study abroad experience forced him to step outside his comfort zone — something the professors say is important. On each excursion, the students were required to engage strangers in Hindi conversation. Zietlow said the ultimate highlight was getting to know Taj and Caldwell not only as scholars, but as people. It was the first study abroad experience for Crayton, who is interested in careers in both medicine and politics. While in Lilongwe, they were based at the Center for Human Rights and Rehabilitation (CHRR), one of Malawi’s leading NGOs. In Zomba, they were hosted by the University of Malawi’s Chancellor College. Students had internships and visited sites including Parliament and UNC Project-Malawi, a research, care and training program established by Carolina and the Malawi Ministry of Health in 1999. Crayton, who is pursuing a minor in African American and Diaspora Studies, had internships with UNC Project-Malawi and CHRR. 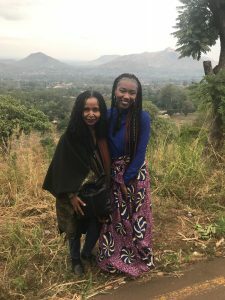 At CHRR, she and other students worked on drafting ideas and writing a proposal for a “50:50” campaign aimed at increasing women’s representation in politics as Malawians gear up for next year’s general elections. The proposal was recently awarded a $100,000 grant. Sahle has been doing research in Malawi for over 20 years. She said creating the new study abroad program was a collaborative process, and she had lots of help from UNC and Malawi partners. 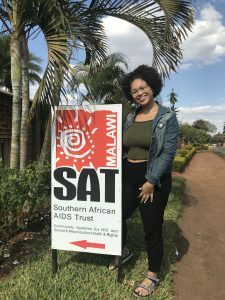 She received support from Bruce Cairns, director of the North Carolina Jaycee Burn Center, Bob Miles, former associate dean of study abroad, and colleagues at the University of Malawi’s Chancellor College early on in the planning process. A key goal was to make the program affordable, and a number of campus entities contributed to that effort so that each student received financial help. According to Sahle, this long relationship was very helpful during the students’ time in Lilongwe and Zomba. Angum Check, a senior philosophy and American studies major, said her summer in Malawi transformed her intellectually. She interned at the Women’s Legal Resources Centre. At the end of the experience, sophomore Karly Smith said she felt like a real scholar. She appreciated the intellectual leaders and human rights activists who served as guest speakers for the program. Sahle said students were not the only ones who benefited from the trip — daily dialogues with Malawian colleagues enriched her teaching and research, too. She is also proud of the students’ contributions during their internships. View more photos of the India trip on Facebook. View more photos of the Malawi trip on Facebook.